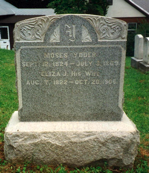 Moses H. Yoder, the youngest child of Christian (YR2514) and Esther Hertzler (HZ57) Yoder, was born at the family farm near Belleville in Mifflin County, Pennsylvania, on May 27, 1833. 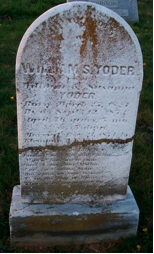 Christian Yoder passed away in 1850 when Mose was a lad of 17. Nicholas Hertzler was appointed his guardian. In addition to the farm in Mifflin County, Christian owned two farms in Mercer County which were offered to his sons, Daniel and Christian after his death. The farm in Mifflin County was sold along with all the farm equipment and livestock. Esther moved to Lawrence County where she passed on in 1861. Esther was the grand-daughter of Jacob Hertzler, the immigrant. Barbara’s home. Barbara was born March 5, 1834, the daughter of Christian and Martha (Kurtz) Kauffman. Moses and Barbara began married life in Wilmington Township, Lawrence County where Sarah Malinda was born in 1856 and Reuben C. in 1858. 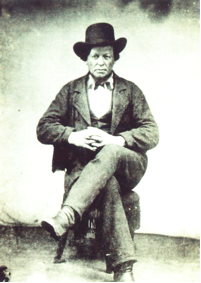 Moses had a reputation for having “itchy feet.” Sometime between 1858 and 1867, Moses moved his family to Michigan, where his sister, Anna, lived. Family legend says that Levi U. was born in Cass County, Michigan but his birth is recorded in Centreville, Michigan, the county seat of St. Joseph County. 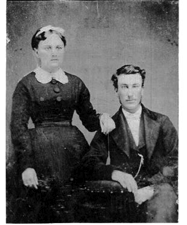 Sister Anna and husband, Jacob Yoder, owned property in both Cass and St. Joseph Counties and it is family legend that Moses’ family lived on Anna’s property in Cass County. The fourth son, Ezra M., was born in LaGrange County, Indiana on November 26, 1871. The family was known to have lived in the small town of Vistula, in Elkhart County, Indiana and then moved to a farm northwest of the village of Schrock, now Honeyville, where Moses had a soap factory. This soap factory is shown in the LaGrange County 1874 atlas. A deed recorded in LaGrange County, Indiana tells us that Moses and Barbara purchased a forty acre farm in Clearspring Township on September 7, 1874. The roads have been changed since that time and we were unable to access the exact spot where their home was located, but Jacob Kurtz (whose grandfather was a brother to Martha Kurtz) told us that the land near where the house stood had much finer soil than the surrounding land. Perhaps Moses continued his soap making here and had a supply of ashes there that were used in his soap making. Barbara passed away on October 7, 1874 leaving a not quite 18 year old daughter to care for the home. We have been unable to locate Barbara’s grave even though we searched every cemetery in LaGrange Co., and nearby cemeteries in Elkhart Co.
About 1877, Moses met Elizabeth Slabaugh and they were married November 27, 1877 in Elkhart County. Elizabeth was born in Holmes County, Ohio on January 23, 1852, the daughter of John and Susanna (Nissley) Slabaugh. She brought to the marriage a son, Hiram Jacob (5-1-1875 to 6-5-1951) whom Moses adopted. Moses’ daughter, Sarah Malinda had married Valentine Marhofer in October 1877. This left a family of four boys for Moses and Elizabeth. Moses, of the itchy feet, sold the farm to Gideon Yoder in April 1878. He was reported to have lived in the Forks Mennonite Church area for a time. Amanda Matilda was born into the family on October 2, 1878. In the spring of 1879 Moses took his family of Levi, Ezra, Hiram and baby Amanda and set out to homestead in McPherson County, Kansas. If Reuben accompanied them on the trip, he returned to LaGrange County, Indiana where he married Maggie Bontrager in December of 1880. Moses had a prosperous farm in McPherson County, near Inman. Emma and Moses, Jr. were born in Kansas. Moses Jr. died at the age of seven months and is buried in an Amish-Mennonite cemetery near Inman, Kansas. Martin was born in March 1888. Again, itchy feet struck and Moses sold his farm to Emanuel Hostetler and in the spring of 1889 took his family mineral prospecting in southern Missouri. They camped at West Plains and later near Caulfied, Missouri. They survived several years of hardship, with little in the way of minerals and poor farmland. In 1892, Mose gave up and returned to McPherson County, Kansas. But he had heard of the proposed opening of the Cherokee Strip in Northern Oklahoma. On September 16, 1893, Mose, with help from Ezra and Hiram, staked his claim in then Woods County, Oklahoma, near what was later the village of Manchester. He was required to build a house at once. 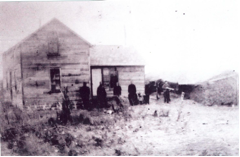 They constructed the walls of a sod house and returned to Kansas. house. He had a successful farm in Oklahoma including a lovely orchard. Here they adopted Ida May in 1898. Moses died June 12, 1911 at his home surrounded by his loving family. Willa Yoder published the “Moses H. Yoder Family History” in 1995. Limited copies are still available at $25.00 each. These consist of 340 pages of family history, stories, pictures and genealogy. Contact Willa at email: wmyoder@charter.net phone 269-651-7368 or 1301 Cato Lane, Apt A12, Sturgis, MI 49091. In the last YNL, we showed how Jacob Yoder of Lewisburg, Pa. (1783-1864) had been identified based on DNA testing to the line of Peter Yoder (OH14). Peter was one of the previously believed natural sons of John Yoder (OH1) . John was the son of Hans the immigrant of the Oley Line (OH) who had been born in Steffisburg to Adam Joder and his wife Barbara Ochsenbein on Mar. 6, 1672, and with his brother Yost became the first known Yoders in America. DNA testing showed that Peter had a distinctive DNA profile and was not a natural son of John. This profile was also found in the Jacob of Lewisburg line, and the testing and analysis of other information made for a definite identification of Jacob as a son of Peter, namely OH146. DNA testing had also revealed that Peter’s older brother Samuel (OH13) was not the natural son of John, nor was he a full brother to Peter. The two boys each had a different father, and were perhaps the subject of unrecorded adoptions. “Old Soldiers. 1. 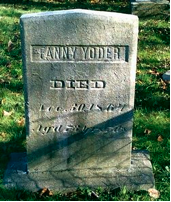 Samuel Yoder, father of George, was a soldier during the French War. He was with Wolfe on the Heights of Abraham in the capture of Quebec, He was gone ten years, and meanwhile endured many hardships and privations. (Everybody had given him up for lost, and as the years rolled on no one thought he would ever return, save his good and faithful wife, who remained constant to him. Her hope was finally realized, to the universal surprise of all, in his safe return.) He came back as one of the wretched examples generally the fruit of war, and finally died outdoors. Land adjacent John Lesher (late Gabriel Boyer) John Yoder, Thomas Lee & Jacob Caughman & Manatawny creek- containing 112 acres w/o allowance for roads, etc. AND the other tract of land situate in Oley Hills adjoining land of John Yoder & Jacob Roads & vacant lands- containing 54 1/2 acres w/o allowance for roads, etc. Obligation ___ George Yoder et al to Daniel Bertolet, Guard. of Abraham Yoder. George Yoder, John Yoder the younger & Peter Yoder pd to Daniel Levan for the use of the said minor David Yoder the full sum of 158 pounds, 5 shillings and 8 pence which is the share part of the said minor David Yoder. Same as above- John Bertolet- for the use of minor Peter Yoder 105 lbs, 11 shillings, & 2 pence. 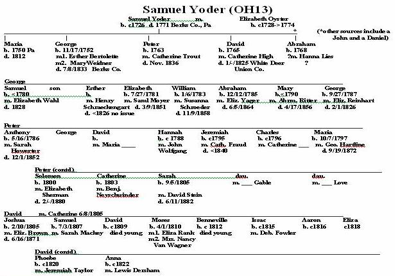 1774---- Samuel Yoder -2- 72 leaving a wife and names five children. It indicates that Samuel had died three years earlier than this (which places the death date at 1771). It identifies son George (eldest son); sons Peter, David and Abraham (still minors); and daughter Mary. OH132- George Yoder was born 11/17/1752 in Oley twp. He died 7/8/1833 and is buried at the Spangeville Cem., Christ Church Cem. By his first wife Esther Bertolette (c1746-1778) he had 2 sons and 1 daughter. After she died he was married on 9/5/1782 to Mary Weidner (11/14/1751-4/1/1846), and they had three more sons and 2 daughters. Mary was a daughter of Lazarus Weidner and Elizabeth Yoder, daughter of Yost Yoder the immigrant. This Elizabeth (1720-12/5/1782 "at 7am of dropsy age 62 yrs") was the Elizabeth about whom the “Yost Yoder Ghost Story” was written. Had George’s father been the natural son of Hans Jr., Mary would have been the father’s first cousin. He can be found in Oley Township through the census of 1830. OH133- Peter Yoder was born in 1763, and married Catharina Trout. Family researcher Tim Conrad reports that they were married 10 Aug 1783, and believes she was daughter of Balthasar Trout and Eva Moser. The marriage was shortly after her father died, so she is single in his will. Peter had a land dealing with the other Trouts and was a tanner like his father-in-law. According to land records. Peter can also be seen 1790 and 1800 in the Berks county census, and appears in Upper Mahantongo Twp., Schuylkill County, Pa. in 1810, 1820 and 1830. (Schuykill Co. was formed from Berks in 1811). Peter died in Nov.1836. Orphan Court records list children Anthony, Solomon, Jeremiah, Sarah, Maria, Hannah, and Catherine. OH135 Abraham Yoder was born 1768. He is the least documented one of the male children. He moved to Upper Mahantongo Twp., Schuylkill County, Pa by 1810 and 1820, and then, it seems, returned to Berks County. Several years ago, we worked out what we believe to be a good portion of his family group and traced it into Ohio, but have been holding off on publishing it until we get a break-thru of documentation. Now the DNA testing has provided the first crack in this wall, as I’ll discuss below..
DNA testing has linked several folks to the line of Samuel Yoder through different sons. Some of these were from “unidentified” lines of Yoders, and others from known or suspected descendants. The testing has also confirmed a unique mutation in the line of oldest son George Yoder (OH132) —namely a value of “16” at the 25th Y Chromosome marker (Marker “464d”) vs the value of “17” that appears to be shared by Samuel himself. Descendants of two different sons of George both share the value, which means he was the source of the mutation. A known descendant of Peter, had the “17” value, as do other test results outside of the George Yoder family. One significant DNA result back is from the line of Abraham Yoder who married Catherine Troutman (labeled as “AC” in our unlinked files). This fellow has long been suspected as being a son of Samuel’s elusive child Abraham Yoder b. 1768 (OH135). His DNA profile ties him to the Samuel line, shows the “17” value which is standard, and thus supports the belief that he was a part of the OH135 family. If we can get one more testee from the correct part of this family, we’ll be ready to bring our OH135 family data into print. from the Samuel line, likely an unidentified son or grandson of one of the other sons of OH13. Another test result which ties into this line is from a descendant of Joseph S. Yoder (1820-1865) who married in 1841 to Annette Glass (Klase) (c1825- ). We’ve labeled him as “BS” in our unlinked data. Like the Moses just discussed, it’s always been easy to confuse this fellow with another Joseph of about the same age. The DNA results show clearly he was NOT from the George (OH132) family due to his not sharing the “17” mutation. It seems certain he was OH13341, Joseph Yoder, oldest son Jeremiah m. Catharina Fraud! We previously had no data about that Joseph as an adult, and can now identify him with some certainty, thanks again to DNA!! YNL INCREASES PRICE ! After 25 years we have finally decided to increase the subscription price for the Yoder Newsletter from $3 per year to $5 per year. This price is effective with renewals beginning with YNL50. Subscriptions already in effect will continue without adjustment. Please continue your support of the YNL! YODER DATA ON DISK. Included back issues of YNL text, census and county records, family group data and pictures and scanned images. The price for our “Yoder Data on Disk” is $10 (postage included). Send to YNL address in Goshen. (Most of this info is also available free at the YNL Homepage). “YODER FIELD”, FT. PATRICK HENRY, VA. This photo, found on the Internet shows the “Army Day parade at Yoder Field, Ft. Patrick Henry, VA, 16 April 1945. Headquarters Company passing the reviewing stand.” The internet tell us that this fort was a German Prisoner of War Internment Camps during WWII. Can any of our readers tell us who the field was named after? OLEY YODERS PLAN NATIONAL REUNION FOR 2010!! See Page 8. “Do you have photos of the grave sites of your ancestors? If so, visit ‘www.findagrave.com’ and add them. You can search by the name of the person using the "Search 20 mil Graves" link on the right-hand side of the home page. If you know the cemetery, it's easier search for the cemetery (link in right-hand column on home page). Then click on "View All Interments" for an alphabetical list. Some cemeteries have submitted a complete list, but most have only those that have been submitted by individuals. If you do not find your ancestor in the list, hit your back button and use the link "Add a Name to This Cemetery." The form that comes up is self-explanatory. Once you submit it, you will have a chance to add a photo. You can upload a photo of the gravestone, the individual or a family photo from your computer. I have recently added several dozen Yoder gravestone photos for the Grace Lutheran Church Cemetery in Newton, NC and a few Mennonite Yoder gravestone photos to Long Green Cemetery in Maryland. It would be great if we could all participate and add many more nationwide. “If you would like a copy of a photo of an ancestor's grave site, you can place a request to have a member who lives in the area take a photo for you. Go to the deceased person's page (or create one if not there already), then click the large button at the lower right . In YNL49 we asked for clues to a postcard which appeared on the internet. Here is the detail we should have shared in the last YNL, but had misplaced. Thanks to Ron Yoder for the research . The building pictured in the April 2007 YNL is located in Evendale, Juniata County, Pa. It was a general store built in 1874. It was built in anticipation of being a hotel for a railroad that was planned to go through this valley. The railroad never materialized but the store apparently operated at least through 1968. It is a bit run down and now contains apartments. A book called The Celebration gives the names of the proprietors. One of these was John H. Yoder. Following him, John’s daughter Mary and son-in-law Banks W. Nace ran the store. 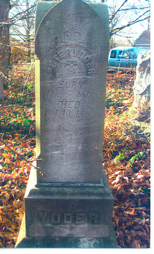 John H Yoder was the son of Moses and Eliza Yoder (see the gravestone photo elsewhere in this issue). He was born in Lewisburg, Union County, Pa. At a young age he moved to Liverpool, Perry County, Pa. He tried farming for a while and then moved to Evendale where he purchased the General Merchandise Store. While operating this store he was also the postmaster from 1900 to its closing in 1912. John married Sarah E. Rowe on Jun. 2, 1878. They had three children: Bessie (died at a young age); Fred R. and Mary J. John died in Liverpool on Feb. 17, 1932. He was survived by his two children and grandchildren Dr. Donald Yoder, Dr. Howard Yoder, and Geneva Nace.---Ron Yoder, Thompsontown, Pa.
WE ARE NOW COLLECTING YODER OBITS to post at Yoder Homepage. Give date, source of obit, Scan it and send it in to cyoder@tds.net, or mail to 551 S Maple St, Saugatuck, MI 49453. Ari Yoder, of the Conrad Yoder line, reports a wonderful tool that allows anyone with internet access to document his or her own ancestry in an effective and simple way. The “Find-A-Grave” web site allows you to: post the name and dates of your ancestor in the cemetery where he or she rests; to add his or her photo; to add a photo of the gravestone; and to post a biographical summary or obituary. Visit the site at: www.findagrave.com . Already recorded are internments for 2,256 -Yoder, 60- Yother, 15- Yothers, 37- Yotter, 9 – Yoter, 18- Yoders, 4- Ioder, 13- Joder, 2- Jotter family members. You can either add your ancestor to a cemetery, or post data on an existing record. For assistance write: Chris Yoder at: cyoder@tds.net . 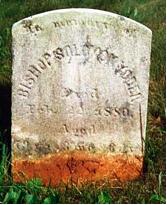 Absalom Yoder (Con61) (1800-1870) buried at Rouch Cemetery, Davis Co., Iowa. Long Green Valley Cem., Md. Ununda Cemetery, Brown Co., Ks. John F. Yoder, died Dec. 18, 1919, Dos Cabezos Cemetery, Cochise Co., Az. Doing a basic 12 marker DNA test costs $101 through the Yoder DNA project. As of this time we have had 65 participants. Testing from strategically selected lines and can show significant results. For an updated status of the project see the links on the Yoder Newsletter Homepage at: www.yodernewsletter.org . or by mail to “The YODER PROJECT”: Family Tree DNA, 1919 North Loop West, Suite 110 Houston, Texas 77008. Coral Gables, Florida, now a part of Miami, was conceived by George Merrick about 1920. It remains a most upscale village, with beautiful homes and the fantastic completely restored Miami Biltmore Hotel. Mr. Merrick carved out the plat from his family farm. It was one of the first planned communities in America and remains a beautiful place to live. The new Coral Gables Museum had a fundraiser on November 14, 2007. The Museum founders invited the grandchildren of Mr. Yoder, Paul Sangster, Jakky Sangster and Dinah Sutherland to attend as representatives of Mr. Yoder. The exhibit features a life-size photo of Mr. Yoder wearing knickers, in the fashion of the day. Jakky Sangster and Dinah Sutherland are seen with Arva Parks, one of the founders of the museum. (YNL Comment- one possibility we’ve been looking at for this Charity is that she could have been one of the unnamed daughter of George Yoder (YR1271)- See YNL 45 ). Walt Disney’s Aunt Was a Yoder! Beloved American legend Walt Disney, was the son of Elias Disney and Flora (Call) Disney . Elias’s youngest brother, William Harvey Disney,. married Lydia M. Yoder on 11/24/1903 in Denver, Colo. Lydia was born 6/2/1885 Kansas City, KS and died 4/28/1965 Ellis, KS. She (YR2349124) was the daughter of Aaron Yoder (5/6/1851 Shanesville, OH-11/12/1916 Los Angeles, CA) and his second wife m2 Anna Vogel ( - 2/__/1918 Ellis,KS of flu) ) (see Descendants of Barbara Hochstetler and Christian Stutzman family # 15232). (Picture of Walt is from the U. S. Postal Service). OH13382- Solomon Yoder (4/30/1821-11/19/1904) m. Elizabeth Reinard (c1826-11/25/1889) bur. Mt. Pleasant Cem. Knoxdale, Jefferson Co., PA.
OH133821- Auspeta, Born March 30, 1841 in Schuylkill Co.
OH133822- Zatavina (Emanuel) born March 26, 1843 in Schuylkill Co.
OH133825- Christina (Dina) Nov. 12, 1850 in Schuylkill Co. Christina died 2-2-1910, Jefferson Co. She married Jacob E. Wolfe, born Aug 26, 1846, Died Feb. 2-1926, Buried in Knox Dale. +OH133828- George Washington, July 26, 1860 in Center Hill, Jefferson Co., Pa.
Con6 Daniel Yoder b. Jun. 18, 1780 d. ? IN m. Elizabeth Cline b. ca1776 (shown with son David in 1860 census age 84) d. ? Helen “Vivian” Warble, 88, Goshen, Indiana, died Feb. 2, 2008. She was born Dec. 29, 1919, in Middlebury Township, Elkhart County, to Raymond S. (YRB17826) and Florence S. (Allison) Yoder. Vivian was a long-time subscriber to the Yoder Newsletter and very proud of her Yoder heritage. Through her efforts a well-attended reunion of Yoders was held at the Greencroft retirement Community in Goshen, with Yoder historian Rachel Kreider as featured speaker. - Hubert Yoder, 82, died January 24, 2008 in Pullman, Washington. He was born on August 19, 1925, in Pullman Washington to Fred and Wilma Yoder. - Stewart Aylmer Yoder, 82, son of Dr. Paul D. Yoder (OY433811) and Kitty Huff, died Feb. 4, 2008. Make your plans now to celebrate St. Yoders Day on August 16th!! You can download and print free St. Yoders Day cards from the Yoder Newsletter website at: www.yodernewsletter.org . The site also include several stories about St. Yoder and his adventures! OLD ZION CHAPEL SAVED IN N.C.
CONRAD YODER FAMILY 58th Annual Reunion the weekend of August 10, 2008, at Zion Lutheran Church in Hickory, NC. For details contact: Phillip Yoder, pyoder@twave.net or Bill Yoder, byodernc@aol.com . Oley Yoder Committee manning a table at a recent Pleasantville Bridge Fest. Greetings from Pennsylvania! The Oley Yoder Group is making plans for a 2008 Family Reunion on Saturday, July 19. We will be meeting at the firehouse in Oley for lunch and a variety of activities. Further information will be mailed to the mid-Atlantic region closer to July. If you are not in our area and would like to receive information for this year’s reunion please send a note to Nancy Yoder at 415 State St. Pottstown, PA 19464 or email or call Martha Yoder at kayoder@netcarrier.com or 1-888-679-8544. We are always on the lookout for new members for our committee. If you live in the southeast region of Pennsylvania and would like to consider joining the Oley Yoder Board, please contact either Nancy or Martha, using the information above. Come and see what it’s all about! One more item of interest--we are planning a possible NATIONAL REUNION for 2010. That is the 300th anniversary of Hans Yoder’s arrival in the “New World”. We are in the process of developing an itinerary and would like your input. Some of you have already given us topics to consider, but we would like to hear from many more of you. What things would you want to see and do? We hope you will be able to join us for our local reunion this year and for the proposed CELEBRATION in 2010. For many years the late Miss Edith Joder, of Allschwil, Switzerland tried to prove the ancestry of her ancestor Christian Yoder who married Barbara Schott. We have labeled this fellow as “YA2” in our unlinked Alsatian records. (or c1787 Morvilliers)-d. 1852 Basel Switzerland “report reached Blotzheim Jul 14”) m 4/2/1816 (or 4/12) at St. Jacob's Mennonite Ch., Basel, Switzerland Barbara Schott (11/17/1794 Blotzheim, Alsace- 2/8/1879 St Jacob, bur 2/10/1879 Munchenstein -near Basel) moved from Huttingen, France to Basel around 1840. A DNA test result from the first descendant of the line has established that this line has the “Amish marker” (Value “16” at DNA marker “19”). This ties him in to one of the two sons of Yost Joder of Steffisburg whose descendants share this marker--- either the line of Hans Joder who married Katherine Reusser, or of his brother Casper Joder who married Verena Stauffer (See details in YNL 50).